Top: Forever 21 (similar), Skirt: River Island (similar), Shoes: Zara, Purse: Michael Kors, Rings: Asos, Watch: Michael Kors, Earrings: Nadri Lips: Laura Mercier in Violet, Nails: Voltage Pink by China Glaze. Thanks! Gotta love polka dots! xo. I am so jealous of that top, it's soooo cute! I love it too--I couldn't find the exact one to post on here from Forever 21 but they do have it in store! xo. Lovely. I love the pop of color in the Zara pumps! Love the black + white! Very chic! Thanks girl! Thanks for reading! xo. Love the outfit, but those heels are killer! Glad you included the lipstick you are wearing, because I was going to ask! Thanks girl! I'd love for you to join! Thanks for reading! xo. 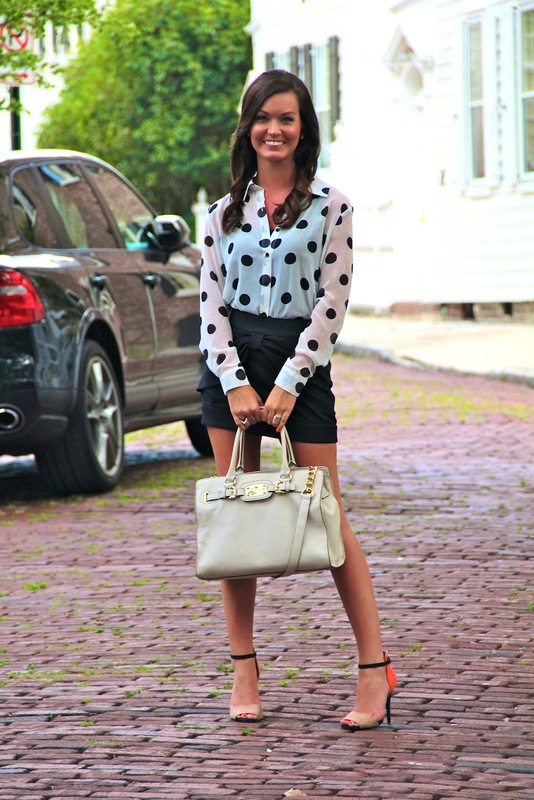 You should wear polka dots every day... THIS is my favorite look... AND they are all wonderful.